PHOTOS: Medical lab techs examine a specimen, perhaps appearing not exactly as illustrated nowadays. Below: Alberta NDP Health Minister Sarah Hoffman, former PC health minister Stephen Mandel, Alberta Health Services CEO Vickie Kaminski and long-ago Conservative premier Peter Lougheed. In a bombshell move reminiscent of Peter Lougheed’s 1974 takeover of Pacific Western Airlines, Rachel Notley’s NDP government moved decisively yesterday to cancel a planned $3-billion, 15-year contract with a private Australian multinational to take over all medical lab testing in the Edmonton region. Even strong supporters of Premier Notley’s government were gobsmacked when the news broke in the afternoon that the plug was about to be pulled on the incomprehensible deal announced by Alberta Health Services on Oct. 17, 2014, with Australia’s Sonic Healthcare Ltd. When yesterday’s announcement was made, it wouldn’t have been that much after 5 a.m. in Sydney, where the $6.7-billion multinational private pathology and lab services company is based, but you can count on it the CEO’s BlackBerry started buzzing anyway. Presumably BlackBerries belonging to Sonic’s lawyers and lobbyists in Australia and Canada also started buzzing soon thereafter. 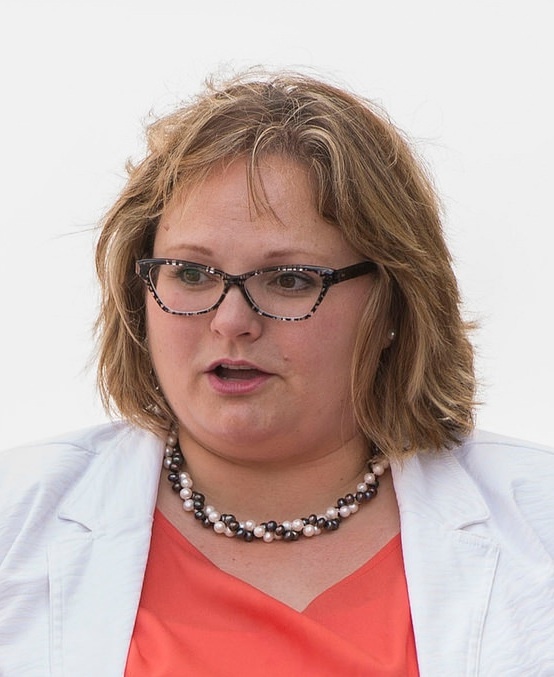 Alberta Health Minister Sarah Hoffman said in a short statement she’d directed AHS to immediately cancel the Request For Proposals process that was quickly leading toward the takeover by Sonic of all Edmonton-area lab services from Dynalife DX, an Alberta company, as well as some public lab services. About 1,100 Dynalife employees and another 500 public employees would have been impacted. Unions representing both groups have strongly opposed the deal. However, Ms. Hoffman elucidated her position in a news conference later, explaining that the Sonic takeover would have put about 30 per cent of medical lab tests in the province in private hands, but that the figure would have been almost 75 per cent in Edmonton and Alberta’s north. She characterized handing over that much of an essential public service to a private, for-profit, foreign company a dangerous experiment. But she could – and possibly should – have also argued, just as Mr. Lougheed did in 1974 when he took over PWA to protect Alberta’s plans to develop its north, that she was protecting Alberta jobs, keeping money in the province and looking out for the economic interests of the province and its citizens. Naturally, the Wildrose Party, heavily motivated by market fundamentalist ideology, assailed the move. “Health minister playing ideological games with our health system,” squawked the headline on the Wildrosers’s quickly cobbled-together press release. 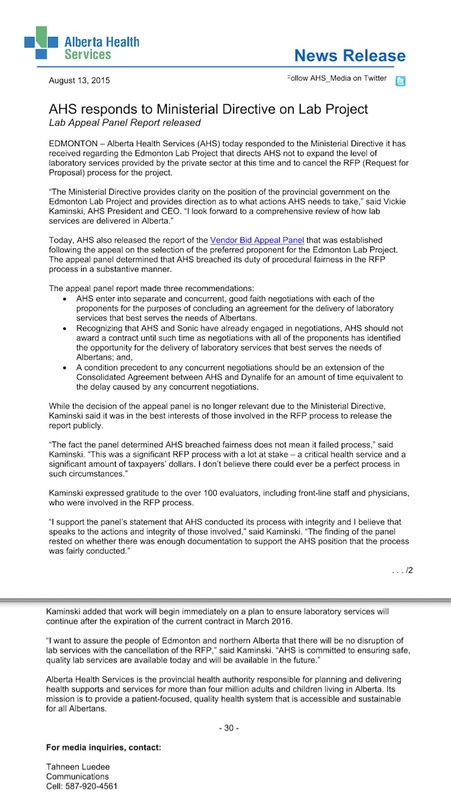 The decision to shut down the deal, never mind that it had been made behind closed doors by the previous Progressive Conservative government and its appointed bureaucrats at AHS, “was driven by ideology and not evidence-based decision making on what’s best for Edmonton and northern Alberta patients,” the Wildrose release said. “The rejection of successful private health delivery within a publicly funded and administered system that leads to lower costs and stronger outcomes is bad news for our health care system,” Medicine Hat MLA Drew Barnes was quoted as saying in the Opposition party’s release – a statement that can be argued with based on how one interprets the underlying facts, but which usefully clarifies the Wildrose position on privatization of health care. No sooner had the Conservative Outrage Machine, Wildrose Division, gone into overdrive on the Internet about how much the inevitable lawsuits were going to cost than the other shoe dropped. So while Ms. Kaminski defended the process notwithstanding its shortcomings, lawsuits were a strong possibility anyway because of the way the previous government did business. As for Sonic, Australian news organizations last night quoted CEO Colin Goldschmidt sounding like a man who might still have hopes of salvaging the deal. “Sonic’s stakeholders can remain proud that Sonic was chosen by Alberta Health Services as the preferred proponent ahead of some of the largest and best known laboratory companies in the world,” The Australian quoted him saying mildly. On the face of it, the Sonic deal never made sense to many Albertans. 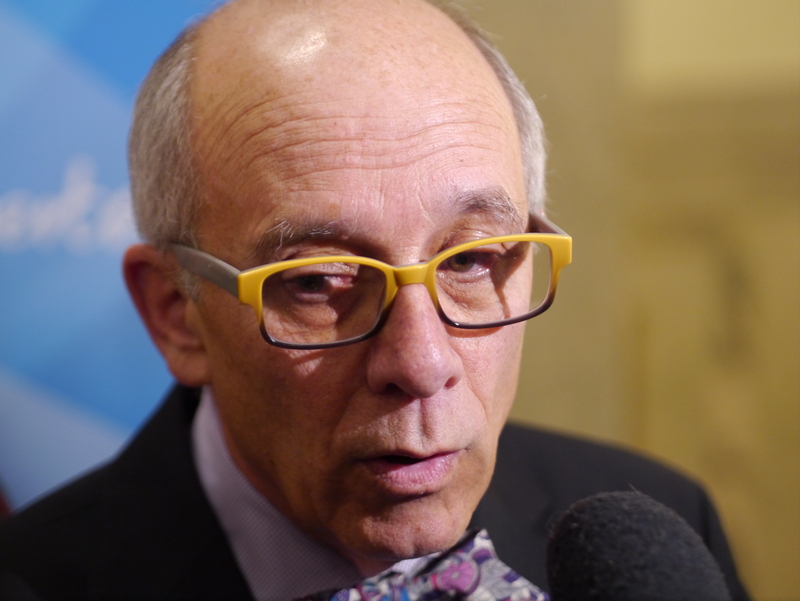 As blogger Susan Wright wrote last November, under the deal cooked up by former health minister Stephen Mandel, Alberta taxpayers would be subsidizing Sonic’s 25-per-cent Australian corporate taxes (compared to the 12-per-cent tax that is far too high for the Wildrose Party and the federal Conservatives here in Canada), financing the corporation’s $2 billion in debt, padding its huge profits, and paying for multimillion-dollar executive salaries plus bonuses and stock options enjoyed by the company’s top dogs. 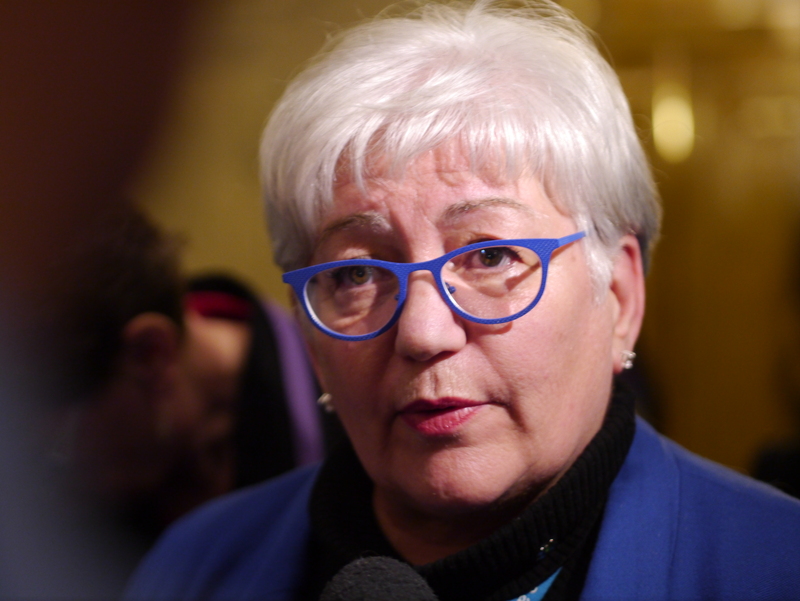 So on behalf of Albertans, Ms. Wright concluded, she had a question for Mr. Mandel: “This is a good idea, why?” Mr. Mandel never provided an answer. By the sound of it, no one else could either. Moving back to the present, Ms. Hoffman will need to move fairly quickly to decide how to proceed, since the current Dynalife contract is scheduled to expire in March 2016. Privatization and contracting out of essential public services make no economic sense. If a service costs $100 to provide with a certain level of quality, the public sector can provide it at $100. However, the private sector has to make a profit out of providing that same service, so if it only charges $100, it can only invest a fraction of that amount (let’s say, $85, assuming a 15% markup) in providing the service, leading to an inevitable erosion of quality. Conversely, if the private sector is going to invest $100 to provide the same level of quality the public sector would have, it must then charge more, maybe $115 or more. Either way, the math isn’t hard: the public sector can do the job better and cheaper. There are times contracting out can make sense: surge capacity for municipal snow removal (to deal with outlier events, not the routine), for example; or large capital construction projects, since the public sector cannot keep large inventories of equipment and personnel idle between jobs. But I have never felt that ongoing government services to the public could be more efficiently delivered by private providers; the profit imperative simply prevents it. Thank you. This is the clearest, most succinct explanation I have ever seen of why the public sector is a better provider of publicly required services. With your permission, I plan to copy it and make sure that my relatives and acquaintances become very familiar with it! Thank you, Anne. You’re welcome to distribute this piece to your friends and relations. This situation is extremely murky, and has been from the get-go. I have amended the lead to say a “planned contract,” since an actual contract with Sonic never seems to have been signed since they were named the “preferred Proponent,” as AHS put it in their documents. There has been a history of strange procurement practices. Stopping this one is a very good move. We have to beat Harper though, so in the meantime let the forensic audit by foip proceed. this is great news for Alberta and shows once again what a disaster the Conservatives were. What is it about Australia and Alberta? Alert readers will recall the exploits of Dr Stephen Duckett, former head of AHS, who was axed by the board a few years back for the famous “cookie incident”. Dr Duckett also hailed from Australia. Having spent considerable time Down Under over the past six years I can report that Australia has a two tiered health system. If you want immediate access to specialists, you’d better have supplementary coverage and pony up a co-pay as well. Anecdotal yes, but a friend needed access to a specialist in May 2015. He got a quick appointment because he paid $150 up front and would have forked over $250 had he not had private insurance. A patient can see a specialist in the pure public system but it takes much longer and you may not get the best. My son had a similar experience. Luckily for him he had coverage and got excellent treatment. The private insurance scheme was instituted years ago by the federal Liberal government and successive Labor administrations kept it going. Any wonder the Alberta-Australia connection? The Tories have been trying to privatize laboratory services since the time of the Klein error. I’ve never understood why they were doing this dumb move since I don’t believe we had any cost savings but certainly may have lost a pile of public cash doing their ideological moves. I believe the government of Alberta under the Tories was responsible for the transfer of some hospital based laboratory services to Dynacare-Kasper Laboratories which then morphed in 1996 to become DynaLIFEDx. In Calgary, I believe they had some private partners that ran off leaving the public with the remains of that privatization scheme. In 1996, premier Ralph Klein sought a private-sector provider to deliver all laboratory services in Calgary. The trouble was that none of the companies wanted the work. In the end Klein cajoled MDS and Kasper Labs into partnering with the regional health authority to form Calgary Laboratory Services. The public sector put up more than 50 per cent of the funding, provided the administrative back up and all of the work. Even so, by 2006 all of the private-sector partners had left and Calgary Laboratory Services continues as an integrated fully public non-profit medical laboratory provider. Yeah, whenever the Tories privatize –the public loses money. I still remember the other major cash hemorrhage in that private surgical venture in Calgary. What was it called? Calgary’s Health Resource Centre (HRC) was once touted as the future of health care in Alberta. But what were the costs of this untidy experiment to the taxpayer? Who knows? We can’t add up all the visible and non-visible costs because no one has actually done this investigation; it would be useful if the Auditor General of Alberta went back in time to see how much this dumb move cost us because it would serve as a cautionary record against future dumb privatization moves on the part of government. project – the $20M hip and knee trial. These are just some of the costs that we know about. Then there was the minor matter that we had this company being allowed to do what work that it chose to do–cherry picking easier surgeries at lower costs to it, for more profit while the public sector had to pay for the more expensive complex cases. a. The comparison in Table 2 is not based on economies of scale. more diverse hospital that also provide emergency care. private surgery does not take on the more complicated cases. the public system – raising overall costs. Then we have the big bankruptcy costs that we don’t actually have the totals for as far as I know. fees totaling anywhere from $3-5M in taxpayer dollars. 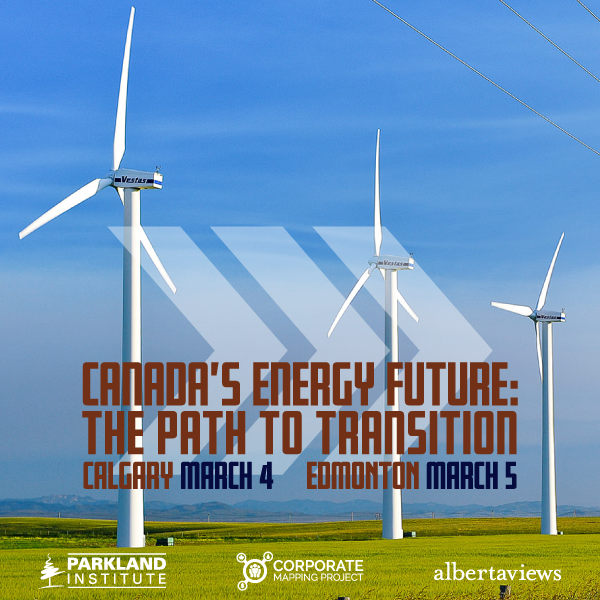 So what exactly was the benefit of this particular privatization experiment to Albertans? I would say we got proof that the privatization model does not work in the area of surgeries and so why bother to tinker with what works? A fast-growing Virginia laboratory has collected hundreds of millions of dollars from Medicare while using a strategy that is now under regulatory scrutiny: It paid doctors who sent it patients’ blood for testing. Health Diagnostic Laboratory Inc. transformed itself from a startup incorporated in late 2008 into a major lab with $383 million in 2013 revenues, 41% of that from Medicare. It built that business selling tests to measure “biomarkers” that help doctors predict heart disease. HDL bundles together up to 28 tests it performs on a vial of blood, receiving Medicare payments of $1,000 or more for some bundles. Until late June, HDL paid $20 per blood sample to most doctors ordering its tests—more than other such labs paid. For some physician practices, payments totaled several thousand dollars a week, says a former company employee. Tax dollars helped fuel HDL. It collected $139 million from Medicare in 2012, according tofederal data released in April after a legal effort by the Journal. HDL’s Medicare receipts rose to $157 million in 2013, a company document shows. Blood-sample fees were “a long-standing, industrywide practice” before the fraud alert, which was “new guidance,” Ms. Mallory said in her statement. Other labs under investigation—Quest’s Berkeley HeartLab, Singulex Inc., Boston Heart Diagnostics Corp. and Atherotech Diagnostics Lab—say they are cooperating. Quest says Berkeley ended payments of $7.50 to $11.50 in 2011 when Quest bought Berkeley. HDL, Singulex, Boston and Atherotech say they stopped payments after the June 25 alert. Of those labs, HDL collected the most from Medicare in 2012. Its $139 million receipts compared with Berkeley’s $17 million, Atherotech’s $16 million, Boston Heart’s $13 million and Singulex’s $8 million. This happy collaboration between private laboratory companies in the USA and medical professionals has resulted in major profits for several companies and we only found out about this sort of junk recently. When you have such ingenuity without check in the private sector, I can only imagine the cash haemorrhage from the public coffers that are still ongoing. And yet the Tories in Alberta want to follow the American model. The insistence to do the laboratory work the private way or the highway in Alberta has resulted in chaos in the area of laboratory medicine for decades and the entire process of forcing privatization on a sector that was doing excellent work at reasonable costs is a scathing indictment of the poor governance record of the Progressive Conservative Party of Alberta that lacked the insight to see that public provision of some essential services such as laboratory medicine, imaging,surgery, ambulance services, continuing care services— might be best. I have yet to see any cost benefit analysis to support privatization of the work done in these areas; in fact we are refused access to the data by the government of Alberta under the Tories. When I a-have requested any information on any company that provides –say continuing care services –they have refused to provide this financial information. The reason? They have cited that this is “proprietary” information. In my opinion, when public money is being provided to any company we should have the right to publish the costs of these contracts, do cost-benefit analysis to prove benefits or otherwise justify the privatization of essential services.If indeed these follow up audit show that we pay less for better work that cannot be provided in the public realm due to lack of current infrastructure, then perhaps such privatization as a limited venture could be justified. Even then, there should be follow up so that the fiasco of Calgary’s Health Resource Centre (HRC) is not repeated. When we privatize we should understand that there are going to be other interests on the part of the provider of services/ products than the customer. When profit is the motive, it is best to realize that the customer isn’t the main concern. The customer may in fact be neglected, or short cuts may be taken to realize cost savings; you also don’t have the same control over private sector providers as you do when you are in the public realm where the requirements and the penalties are clear to all workers. A case in point is the situation my handicapped sister is in where the folks at AHS tell us that there is nothing they can do with reference to the private continuing care providers because they don’t have any power in these private contracts. This makes me wonder why we are privatizing any continuing care facility in Alberta if AHS–which is delegated the work of enforcing the legislation dictated by Alberta Health —can’t do anything about the folks it makes contracts with. It seems very odd to me. Maybe AHS can’t do it’s job simply because it isn’t interested in doing it’s job? In any case, it was a good thing that Ms. Hoffman dumped the private way of the Tories. It’s been our family experience in continuing care that privatization is a bust (at least in continuing care). I believe that Ms. Hoffman was right to make this decisive move to end the privatization of laboratory services. Even if we have to have some of this laboratory work outsourced to a private provider still –at least we are not farming out 15 years of work to a foreign company– in the same rash way as Mr. Harper has done with the FIPA with China, albeit for a longer time frame than this. I’m not in favour of contracting out of essential services. Contracting out of the endless numbers of managers and other less than productive civil servants who do not provide deliverables or who are arrogant with citizens about their failures to be transparent and accountable (think AHS) –well that is perfectly acceptable to me. While I don’t favour privatization, I do believe there are some folks in the public sector who aren’t providing us with deliverables and that these folks need to be fired. I believe there does need to be a whole scale pruning of non-productive workers in the ABCs (agencies, boards and commissions) with the merging of many of these entities/ or their outright elimination. 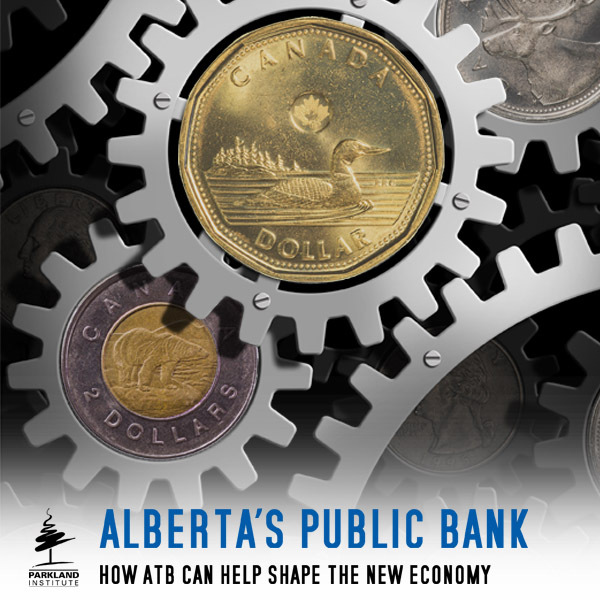 As for the remaining ABCs, we need to be getting value for the major amounts of cash these entities are costing Albertans. We should also be getting reports from sectors of the government that we get no information on such as the Protection for Persons in Care office, the Ethics and Compliance Office of AHS and the Patient Relations Office of AHS. Why don’t we get any reports on these offices that are critical for the proper performance of duties in the health and continuing care systems? We can’t even find out how many people are employed at these places. As for the AHS manuals that should be available to the public without a FOIP request? Good luck getting ANY information from AHS. The walls are high at the AHS fort and you won’t be getting any information -even after your MLA writes to the powers that be at this place. Changes in transparency and accountability require legislative changes that will come into existence with the new government we have elected. It would be useful if the NDP did a disciplined review of all legislation and make effective use of their possibly single term in government by revamping all the dinosaur laws and bringing Alberta into the modern era. The NDP needs to prioritize the problems and make the laws ASAP. Just the legislation that governs continuing care alone is a major area to overhaul. I also suggest that they should ensure that all contracts with any private care provider or any contracted company should allow for the revelation of the costs of the contract. I am tired of being told that the money we provide to government cannot be detailed to the public—due to the nonsensical “proprietary” information junk. We already get this proprietary information excuse where fracking cocktails are concerned and to have this excuse being expanded to shield companies from taxpayer review of the monies spent is just a joke. And I hope this joke by the Tories will not continue with the NDP. I completely agree with your summary of the situation Julie, and your recommendations going forward. Just plain logic ( a very scarce commodity in these here parts ) dictates that a ‘changed’ legislative agenda, such as that assumed, by us, of the Notley gov’t, to more than 2 generations of criminally irresponsible theft of the commons by (I love this) the Klien error, would require massive, wholesale firings of senior bureaucrats in the ABC. As necessary as this is, it would be hugely disruptive. To minimize the disruption, we do need a public review of the costs and benefits of these incredibly expensive agencies, boards and commissions. Until and unless we have dozens, if not hundreds of firings in the public service we can be sure we are getting exactly the same kind of government services (namely wealth transfer from public to private hands) as we have received for the past 3 decades. for the record, the right-wing propaganda sheet masquerading as a newspaper called “the australian” is wholly owned by rupert murdoch. -alfred venison. “Moving back to the present, Ms. Hoffman will need to move fairly quickly to decide how to proceed, since the current Dynalife contract is scheduled to expire in March 2016.” Ms. Hoffman will make life easier for everyone if she simply decides that Edmonton, like Calgary, will have a publicly operated medical labs system. Reopening this contract to the private sector will simply start the Sonic vs. Dyna Life arguments once again and open the government to claims that it is violating international trade rules if it favours the local private company. There is no advantage to having a private company operating a monopoly service in any case. 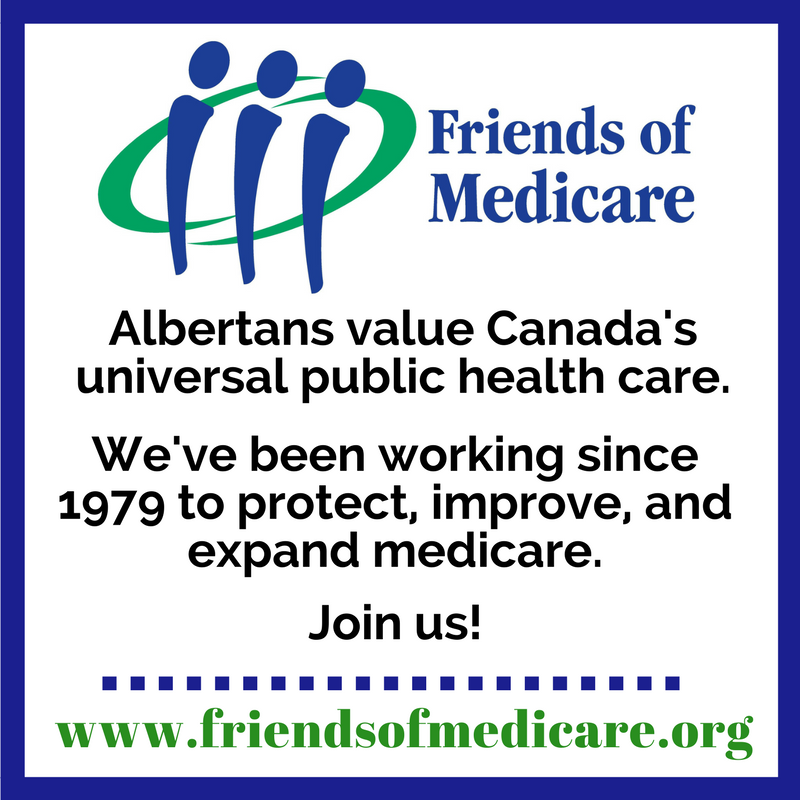 The 10 percent or more profits that Alberta taxpayers would have to pay a private company can be used for some combination of reducing the costs of this medical service to Albertans, paying the workers better, and hiring more staff. The NDP government is concerned to protect jobs and provide an excellent service to Albertans; it can do this best by having the service delivered publicly. I think this was a sensible response and solution to a mess made the by the previous PC government. 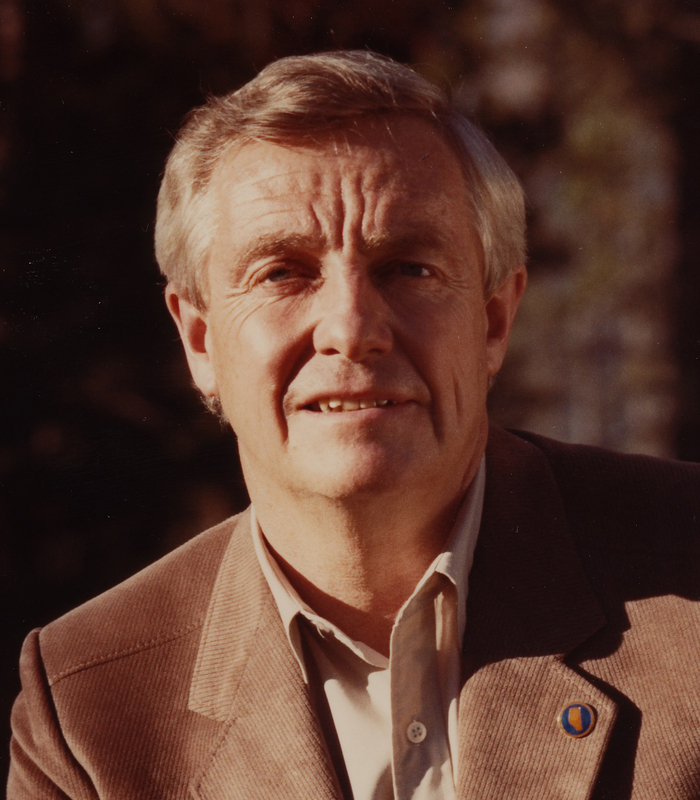 At one time the PC’s governed sensibly, perhaps back when Mr. Lougheed was in power. Somewhere after 20 years in power or so, they started to lose it and started doing goofy things like this medical lab services contract and it got particularly bad towards the end. I suspect the NDP will be very busy for some time digging through all the messes the PC’s left. Perhaps the PC’s developed the political equivalent of dementia in old age and it would have been better if they had been retired sooner. In any event, I don’t think the issue here should just be ideological, like the Wildrose is trying to make it into. Even on the surface it seems puzzling to award a 15 year multi billion dollar contract to some company half way across the world that as far as I could tell had no experience in this market. This like many of the PC’s recent health care initiatives this seemed like a recipe for disaster and I think it is better to nip this potential disaster in the bud.